Chris Skidmore praises Colin Richmond’s 1985 article, which offered a new theory, later confirmed, about the true location of one of the most famous battles in English history. Articles that turn history on its head are rare, but this is what Colin Richmond’s piece, The Battle of Bosworth, achieved, demolishing centuries of accepted wisdom about where the fateful encounter between Richard III and Henry Tudor in 1485 was fought, so transforming our entire understanding of the event. 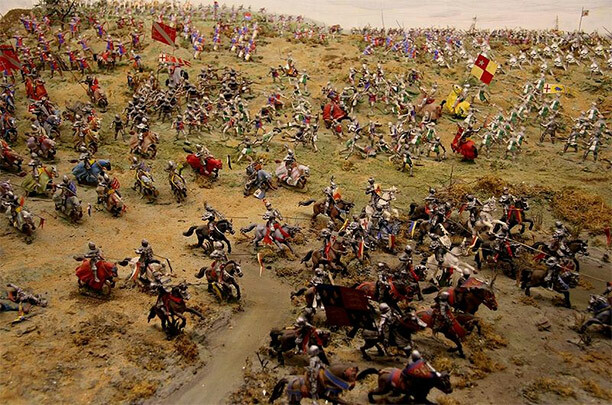 Historians have long known that the original name for Bosworth was the battle of Redemore; that the battle had been fought upon a plain; and that Richard III had been swept off his horse by Sir William Stanley’s men into a marsh. But where exactly was Redemore? Ever since the publication of William Hutton’s Battle of Bosworth Field in 1788 it had been assumed that the fighting had taken place at the base of Ambion Hill, near Sutton Cheyney in Leicestershire. The only problem was that its terrain did not reflect the geographical features mentioned in the sparse contemporary sources. Yet this had not prevented the opening of a battlefield centre at Ambion in 1974, complete with an ‘authoritative’ account of where Richard III’s last stand took place, commemorated by a marker stone. Richmond had been leafing through signet warrants from Henry VIII’s reign, held in the National Archives, when he came across one from August 1511 allowing the churchwardens of Dadlington parish, near the battle site, to collect contributions for a chapel ‘standing upon a parcell of grounde wher Bosworth feld otherwise called Dadlyngton feld ... was done’. The warrant had been catalogued in the Letters and Papers of Henry VIII, but the crucial line mentioning Dadlington field had been omitted. Here was evidence, surely, that the battle of Bosworth had not been fought at Ambion Hill, but a few miles down the road, near Dadlington. Published on the eve of the 500th anniversary of the battle, when Prince Charles and Princess Diana would come to visit the heritage centre, Richmond’s article seemed to throw a hand grenade into the celebrations. The media interest was immediate. ‘Was the Battle of Bosworth at Bosworth?’ The Times asked, devoting its front page to the discovery. But supporters of the traditional site at Ambion Hill would not go down without a fight. The curator of the battlefield centre, Daniel Williams, responded in History Today two months later, dismissing Richmond’s claim. Richmond’s standard was taken up by Peter Foss, who combined his expert knowledge of local topography, geology and a close reading of the original sources to produce The Field of Redemore (1990), the first revisionist account, which sought to locate the exact site of Redemore. Foss’s further discovery in local records that ‘Redmor’ lay ‘in the fields of Dadlington’ reinforced Richmond’s argument. Other historians weighed in to the debate, including David Starkey in the October 1985 edition of History Today and Michael K. Jones in Bosworth 1485: The Psychology of a Battle (2002), claiming that it could have been fought much closer to Merevale Abbey, near the present A5. In 1995 English Heritage decided to include the fields around Dadlington in its Register of Historic Battlefields, but it was not until 2004 that the Heritage Lottery Fund, the Battlefields Trust and Leicester County Council together secured funding for an archaeological project led by Glenn Foard to locate the battlefield site. The painstaking work would take years before, on March 1st, 2009, a small lead ball, 30mm in diameter, was discovered further west of Dadlington. By December 2010 33 lead projectiles had been uncovered, a greater number than from all other archaeological surveys on battlefields of the 15th century combined. The coup de grâce was the unearthing of a small silver gilt badge of a boar: Richard III’s insignia. Here, then, was proof that Richmond had been right: Bosworth had never been fought at Ambion Hill, but on the plainland several miles west near to Dadlington, around the marshy terrain of ‘Redemore’. Once again the media circus assembled, claiming the battlefield had been ‘rediscovered’. But it is perhaps thanks only to Richmond’s History Today article that we ever started to look elsewhere in the first place. Chris Skidmore is Member of Parliament for Kingswood. His book Bosworth: The Birth of the Tudorsis published by Phoenix in paperback in June 2014.